Before we had children, a night out was incredibly simple, the most complex part being remembering to feed the cat before we left. A leisurely shower, a lick of make-up, a fresh pair of jeans and we were ready to hit the town. Nowadays we never go out. Never. Except our lovely neighbours had invited us to a Christmas party at their house – children also welcome. As it was literally across the road, we thought that even though it meant a slightly later night for the children, we’d give them an early bath, stick them in their Christmas jumpers and pop across the road for some festivities. TheBloke (TM) and I smiled at each other, safe in the knowledge we were excellent parents who had this parenting totally sewn up, and we were going to get a night out. Planning to be across the road at 7 p.m., at 6.15 on the dot we ran a bath for the children. TheBloke (TM) undressed YoungestGirl whilst I supervised EldestGirl. “WALK! WALK!” exclaimed YoungestGirl, keen to waddle into the bathroom by herself. “NO CARRY! WALK!” She mostly speaks in capital letters. EldestGirl meanwhile found seven Very Important things to do, which did not include taking her clothes off. I thought I would use this time to make myself look vaguely presentable. On the landing, I passed YoungestGirl, who made it into the bathroom before saying “UH-OH!” and again, “UH-OH!” and started crying. TheBloke (TM) was a step behind. 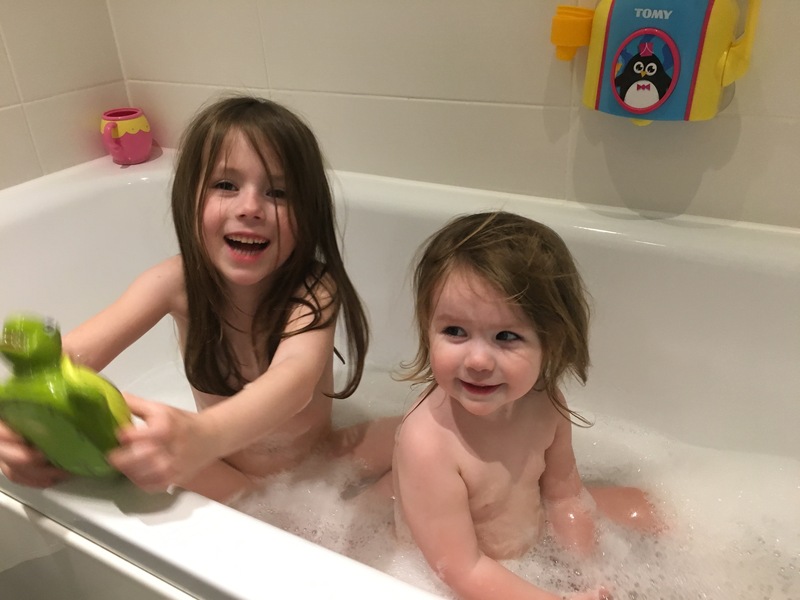 “Take your clothes off, please, EldestGirl,” I said, a slight edge creeping into my voice as I mopped up the last of the wee and plonked YoungestGirl into the bath. We would still have a serene evening. I returned to our bedroom to continue getting ready. “AAAAAARGH!” said TheBloke (TM) in a voice that suggested extreme pain, having skidded on the off-brand Dettol and stubbed his toe quite hard on the door frame. I went back into the bathroom, removed EldestGirl’s last remaining vestments and manhandled her into the bath. I put on some foundation, badly. I’d like to blame the children for this one, but I’m actually generally just incompetent at make-up. TheBloke (TM) put YoungestGirl’s clothes in the wash bin, whilst limping. I had about twelve seconds all to myself before my attention was required. YoungestGirl was airlifted to the safety of a towel and wet-wiped vaguely clean. EldestGirl was held under the shower to rinse off any poo germs. Meanwhile, TheBloke (TM) stubbed his toe again. Half an hour later, already feeling like we had had quite enough for one evening, we arrived at our neighbours’. Dishevelled, knackered, and likely smelling of human effluent, we still managed to have a lovely time. The moral of the story is you can choose: children or a social life. You can’t have both. Nobody has both.